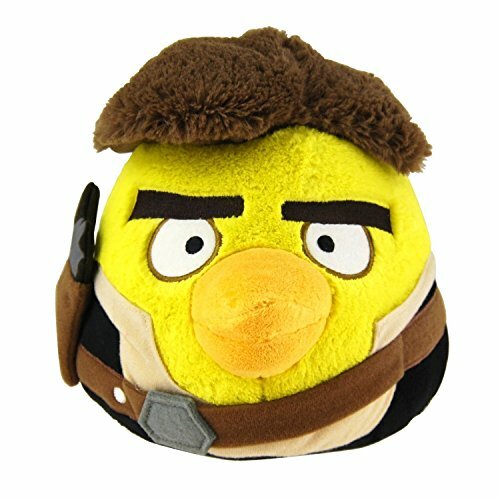 Angry Birds Chuck is a soft and cuddly replica from the Angry Birds Motion Picture and hit Rovio game. Chuck Fast and Foolhardy talks and says four funny phrases from the movie. Collect them all and recreate your favorite battle….the survival of the Angry Birds is at stake! 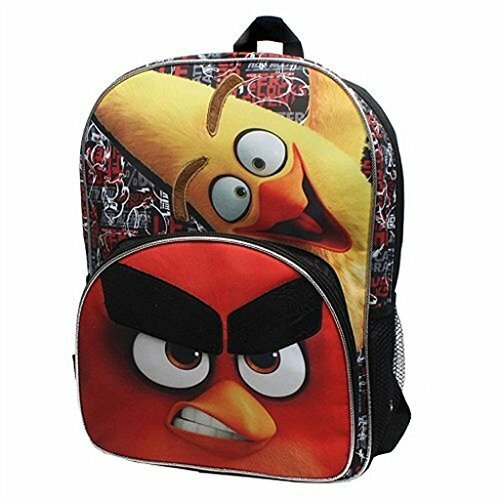 With plush eyebrows, this kids' Angry Birds backpack will make your little one smile. Introducing the Rovio licensed angry birds Chuck IR UFO heli ball! featuring a coaxial rotor system for precise movement and increased stability when hovering. The UFO heli balls body is also constructed with a durable material making it strong yet lightweight so you don't have to worry about breaking anything when it lands a bit too rough. Using infrared motion sensitive technology, the UFO ball will detect nearby objects and is programmed to move away from them. Simply turn on and launch to get started, holding your hand underneath it will keep it hovering up in the air. When done flying you can try and grab it but you can also use any IR remote control to shut down and recover safely, it's that easy! 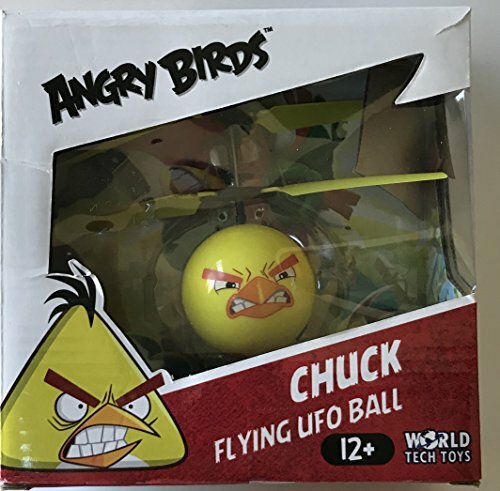 a must have for fans of helicopters, get the Rovio licensed angry birds Chuck IR UFO heli ball today!. 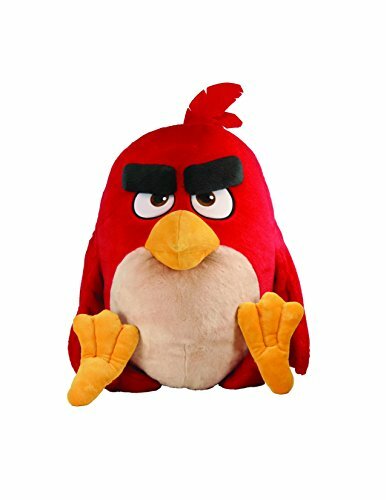 Angry Birds Jumbo Red is a soft and cuddly replica from the Angry Birds Motion Picture and hit Rovio game. Each character talks and says funny phrases from the movie. Angriest of them all, Red talks and says eight funny phrases from the movie. Collect them all and recreate your favorite battle….the survival of the Angry Birds is at stake! See your favorite Angry Birds characters collide with this 5-pack of Angry Birds Speedsters Figurines by Spin Master! These plastic toys are each equipped with wheels so they can zoom around wherever you take them. Race them against each other or set up objects for them to knock down. 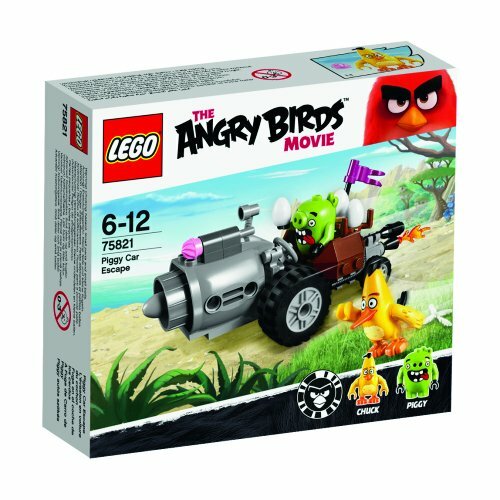 This set comes with 5 different figures, including 3 of the Angry Birds and 2 of the pigs so you can even set up teams. These items are suitable for ages 3 and up. This Angry Birds Action Figure will bring hours for enjoyment to a child's playtime. You can bounce it, squeeze it and ever throw it up in the air, all in good fun. This vinyl action figure, Chuck, is a bright shade of yellow with big eyes. Reenact action-packed scenes from the movie. Pretend that he is getting himself in and out of trouble, while he is running around super fast and talking rapidly, non-stop. This kids' action figure is a fun collectible for any young fan. You do not need any batteries to operate this adorable toy. Play with it indoors or outdoors and bring it along on road trips to have fun in the car. Pair it with the entire flock of Angry Bird, including Red, Bomb, Matilda, Mighty Eagle, Terence, Stella as well as Leonard, also known as King Mudbeard, and the Pigs (each sold separately). The Angry Birds Anger Management Talking Red is a fun figure for fans of the hit film and video game series to enjoy. It features a detailed, realistic design based on the movie that allows for more immersive play. This kids' action figure has a movable arm that activates some of Red's most famous sayings. It's part of a larger set that includes Pig, Bomb and Chuck, which you can purchase to complete your collection for even more fun. The toy comes with instructions that make it easy to use. You can play with it or set it up for display in your hobby room. 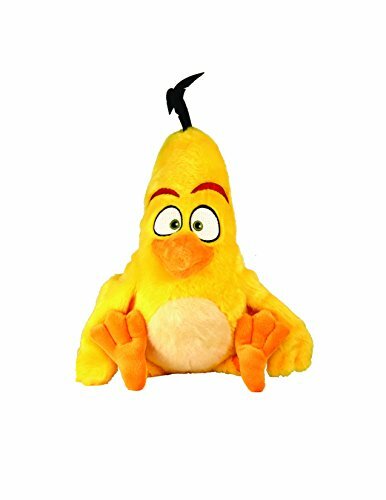 The Angry Birds Explosive Talking Bomb lets you play with one of the beloved characters from the hit film and video game series. It features a detailed design that's true to the look of the film. This Angry Birds action figure talks when you move his arm so you can enjoy more immersive play. It's part of a larger series that you can purchase to complete your collection and play with all three of the main characters plus the treacherous pigs. It requires three alkaline batteries to run and comes with a set so you can start using it right out of the box. This product makes a fun gift for your favorite fan of the series. 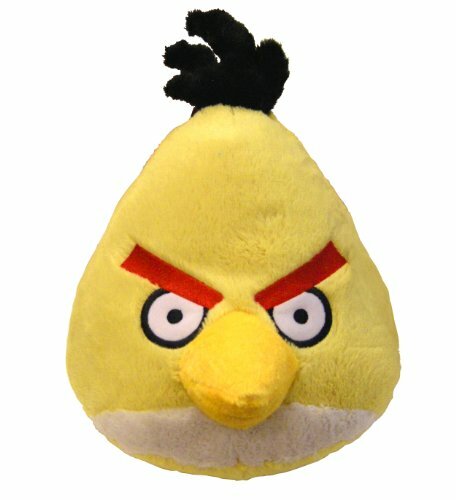 The Angry Birds Tricky Talking Pig is a fun gift for any fan of the hit film and video game series. It has a movable arm that activates it to speak fun sayings. This kids' action figure has a realistic design based on the pig's appearance from the movie. The toy is part of a larger set that includes Red, Bomb and Chuck (each sold separately). Children can collect them all to recreate one of their favorite scenes from the popular movie or come up with their very own adventures. This Angry Birds action figure comes with three required alkaline batteries, allowing kids play with it right out of the pack. The instructions sheet makes it easy to learn and operate the toy. This detailed figure helps to make playtime more fun. Little ones can use this Angry Birds Action Figure to play catch with friends or to bounce it off of walls. The colorful baseball-sized item features one of Leonard's many pig sidekicks. This vinyl action figure is ideal for bouncing, squeezing and throwing. Set up wooden blocks in your yard to see who can knock the most down with this novelty piece. Add the fun item to a growing collection of similar products that includes Red, Chuck and Bomb (sold separately). Place it on display when not being used or store this delightful toy with outside activity equipment to have handy for everyday use. Bring the pig action figure to family functions for youngsters to have a fun object to use while participating in outdoor events. Be silly while recreating favorite scenes using this adorable round version of one of the animal types featured in the Angry Birds game. Little ones can use this Angry Birds Action Figure to play catch with friends or to bounce it off the walls. The colorful baseball-sized item features a well-known character from the game, Leonard. The kids' action figure is ideal for bouncing, squeezing and throwing. Set up wooden blocks in your yard to see who can knock the most down with this novelty piece. Add the vinyl action figure of Leonard to a growing collection of similar products that includes Red, Chuck and Bomb (sold separately). Place it on display when not being used or store this delightful toy with outside activity equipment to have handy for everyday use. Bring the kids' action figure to family functions for youngsters to have a fun object to use while participating in outdoor events. Have fun recreating favorite scenes while holding this adorable round version of Leonard. Play Angry Birds in real life with the Angry Birds Action Figure. It's made from vinyl, which holds its form but is also soft enough for throwing and catching. This Red action figure bounces when it hits a hard surface so you can recreate your favorite game moments. Complete the series with Red's friends, Bomb, Leonard and Chuck to have fun with the whole team (each sold separately). The sculpting makes the appearance true to the game and films. There are no batteries required so you can have fun right out of the package. The Angry Birds Action Figure is suitable for inside and outdoor play. Set up rocks, sticks or other items and knock them over, just like in the video game. ANGRY BIRDS Mirror CHUCK The Yellow Bird Head Shaped ROVIO Great For Kids NEW!